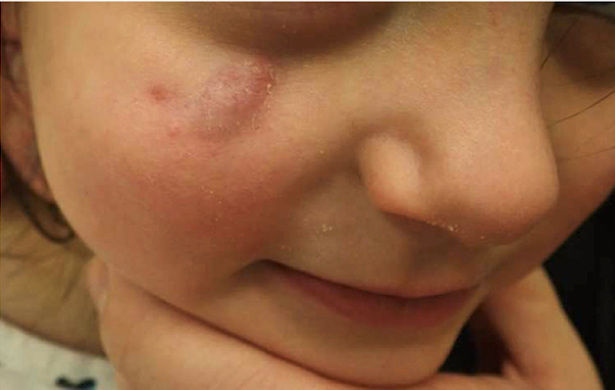 A healthy 3-year-old girl presented to a dermatology clinic with a 6-month history of a nodule on her right cheek. 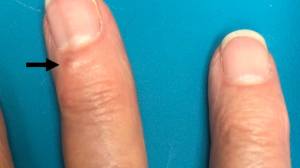 The patient’s mother described an early increase in size of the lesion, but at the time of presentation, the size of the lesion had been stable for several months. 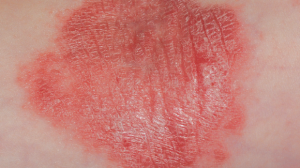 The patient initially had presented to her pediatrician and had been prescribed mupirocin ointment, which had not improved the appearance of the lesion. The patient did not have associated fever or constitutional systems. 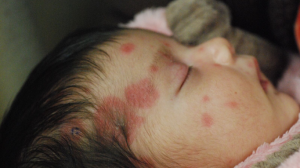 Examination revealed a well-appearing child with a nontender, red-purple, subcutaneous nodule overlying the right zygoma (Figure). The nodule was soft on palpation. 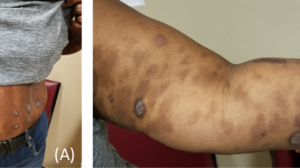 Physical examination findings were otherwise normal, with no lymphadenopathy noted. Our patient was prescribed triamcinolone ointment, 0.1%, to be applied to the affected area each night for 1 month. 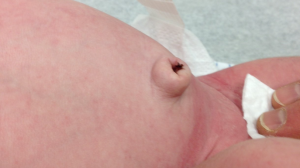 At the patient’s 6-month follow-up visit, the nodule had demonstrated significant regression and needed no further treatment. González Rodríguez AJ, Jordá Cuevas E. Idiopathic facial aseptic granuloma. Clin Exp Dermatol. 2015;40(3):298-300. Orion C, Sfecci A, Tisseau L, Darrieux L, Safa G. Idiopathic facial aseptic granuloma in a 13-year-old boy dramatically improved with oral doxycycline and topical metronidazole: evidence for a link with childhood rosacea. Case Rep Dermatol. 2016;8(2):197-201. Neri I, Raone B, Dondi A, Misciali C, Patrizi A. 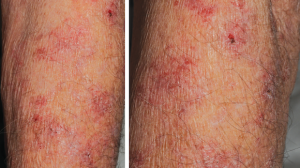 Should idiopathic facial aseptic granuloma be considered granulomatous rosacea? Report of three pediatric cases. Pediatr Dermatol. 2013;30(1):109-111. Zitelli KB, Sheil AT, Fleck R, Schwentker A, Lucky AW. 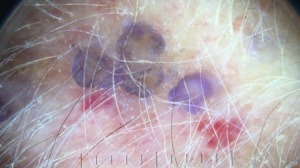 Idiopathic facial aseptic granuloma: review of an evolving clinical entity. Pediatr Dermatol. 2015;32(4):e136-e139. Knöpfel N, Gómez-Zubiaur A, Noguera-Morel L, Torrelo A, Hernandez-Martin A. Ultrasound findings in idiopathic facial aseptic granuloma: case series and literature review. Pediatr Dermatol. 2018;35(3):397-400. 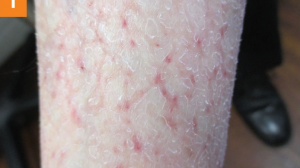 Boralevi F, Léauté-Labrèze C, Lepreux S, et al; Groupe de Recherche Clinique en Dermatologie Pédiatrique. 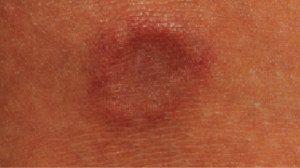 Idiopathic facial aseptic granuloma: a multicentre prospective study of 30 cases. Br J Dermatol. 2007;156(4):705-708.